When SVP of AOL Marty Moe left the company in 2010, those loyal to him knew it wouldn't be long before he came back with something big, ambitious, and creative. By November, 2011 Moe launched The Verge, a personal tech site that attracted some of the best talents from AOL's Engadget, including Joshua Topolsky, who became Editor. With Moe's track record for championing first-rate content, it wasn't long before The Verge became recognized as a top tech website. Those wondering what The Verge's co-publisher would do for an encore got their definitive answer last week, as Polygon went live. It hopes to do what The Verge did for tech for coverage, but for the $25 billion gaming industry. And once again Moe has assembled an all-star editorial team to tackle the challenge, including former Joystiq Editor-in-Chief Chris Grant and Managing Editor Justin McElroy, Kotaku founder Brian Crecente, and The Escapist's former Editor-in-Chief Russ Pitts. Within hours of Polygon's launch, Moe took time from his frenetic schedule to talk to dealnews about his plans for the site, and how he hopes it will stand out among the countless portals covering the gaming universe. What has the success and popularity of The Verge taught you in terms of laying down a blueprint for a great gaming site? Marty Moe: Our experience with year one of The Verge has only reinforced our belief that audiences interested in tech and video games are hungrier than ever for an expansive and ambitious editorial vision that combines the most authoritative and influential journalism with the most beautiful design. We have spent, and will continue to spend, a lot of time and effort trying to combine the best elements of the traditional newspaper and magazine form — substantive depth and credibility, visual elegance, editorial diversity, attention to detail, compelling advertising, etc. — with the publishing pace, audience participation, socialness, and personality inherent in the web/digital medium, and optimizing that experience for whatever size device is being used. Ultimately, we seek to create the most powerful digital expressions of all these things to bring tech and gaming audiences (and the advertisers that want to reach them) a higher-quality experience than they ever thought possible. There are a number of sites that cover the world of gaming. What's missing, in your view? Tell us about the qualities and features that will set Polygon apart. MM: We faced the same questions when we launched The Verge —namely, why does the world need another tech site? And our rationale for the games category is largely the same. We start with the fact that, as gaming audiences have grown up and platforms have multiplied, video games have become a core form of modern entertainment and an increasingly relevant cultural touchstone. Nevertheless, in our view, the existing games sites have tended to do only one or two things well. Some cover news, some do reviews, some commentary, others focus on video, game information, feature writing, or community forums. But no one has either had the vision or wherewithal to put all these things together, do them all at the highest level of quality and professionalism, and express them with the beauty and depth of the games magazines that have largely disappeared. By doing this, we believe Polygon can become a premier destination for a broad, thoughtful, and influential audience. Gamers are known to be a vocal and opinionated lot, and always one step ahead of the rest of the population when it comes to social media, web community, etc. How does Polygon plan to work with the gamers? How will their voices and opinions help shape editorial strategy? MM: As a media company, our audience is our most valuable asset. And as a digital media company, one of our highest priorities is to provide our audiences a platform in which to become an integral part of what we do: to discuss and share our content, interact with our editors, to tell us what we're doing well and not so much, and engage in independent discussions relating to what we cover. Vox Media's Chorus platform enables Polygon's readers to be full participants in everything we do via powerful commenting tools and a forums experience that let our readers become writers and promotes the formation of organic communities. A great example of this is the Polynauts, a completely organic, large, and dynamic community of reader/writers that has a dedicated Polygon forum to discuss topics of interest. Take us behind the scenes and tell us about the efforts it took to launch Polygon. How long did this take and what kind of resources are at your disposal? MM: The Polygon project started about a year ago when Chris Grant decided to join Vox Media to lead the project. We've known and respected Chris for a long time; he shared our big vision for what a games site could be, and he ultimately believed that Vox Media was the place that would best allow that vision to flourish. Once Chris got started, the Polygon project had essentially three phases, all of which overlapped. Phase I was the hiring of the most talented team of veteran games journalists we believe has ever been assembled. In the second phase of the project, we got the Polygon team set up on the games hub of The Verge so they could start writing as a team, developing how they wanted to work together and cover the category, and building an audience that would come with them when Polygon launched. The final phase was the actual planning, designing, and building of the site itself, which went live to the world on October 24. 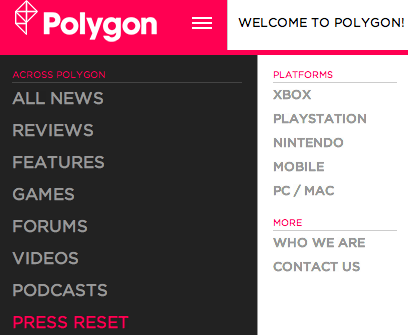 Oh, and somewhere along the line we managed to acquire the domain name, Polygon.com, which made all of us a lot less nervous that we might launch without a name! With some of the new Polygon staff departing from The Verge, we sense a bit of good-spirited rivalry going on, and some fond farewells. How will staffs at both websites work together to forward coverage in both worlds? MM: The Verge will cover big gaming stories in a way that is relevant and accessible to a tech-focused audience. Polygon will do likewise with respect to certain big tech stories. The teams will collaborate as they feel appropriate, but ultimately will focus on what they think works best for their respective audiences and brands. The news waits for no one, and there are already big stories to cover in gaming as Black Friday draws near. What kinds of stories have you and the Polygon staff especially pumped? 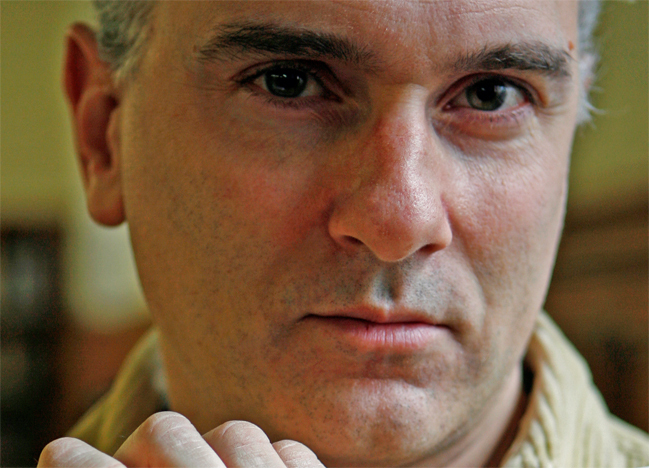 MM: The stories that get us most excited take our readers behind the curtain and go well beyond just what a new game is about, but explain who is behind it, how it was made and why, what's special and important about the game and why it matters. We love to tell our audience things they never knew or even thought about, but that are fascinating. These are human stories, the stories that put context around the games and that help the audience understand what's going on and why it's important (or not). Marty Moe stares into his crystal ball and it's October 2013. Polygon has become all that you dreamed it could be. Tell us what that looks like. MM: Polygon has followed a similar trajectory as The Verge. It has become one of the most, if not the most, influential sites in games journalism and media. Polygon has a fast-growing and loyal audience who is consistently wowed and fascinated by its coverage. A wide range of advertisers find great value in Polygon's audience and our ability to help them reach that audience most effectively. The world never knew video games media could be this good or this big.